Monarch Air Group provides private air charter in San Jose, CA. Our clients benefit from top-notch service, unrelenting dedication to safety, wide selection of aircraft, and years of experience in chartering private jets. To obtain a free quote, please use our online quoting tool provided below, or call toll free 1-877-281-3051. Monarch Air Group offers a wide variety of private jet charter options to and from San Jose, California, United States. 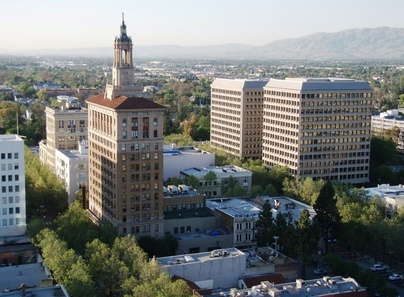 San Jose is the third most populous city in the state of California, and the tenth in the country, with a population of up to million people. It is also the largest city in the Bay Area and Northern California. Known for its high cost of living and affluence, San Jose is considered as a global city. San Jose is one of the most popular tourist destinations in the world, with a host of breathtaking tourist attractions, including the Municipal Rose Garden, Winchester Mystery House, Rosicrucian Egyptian Museum, Cathedral Basilica of St. Joseph, Happy Hollow Park and Zoo, Japanese Friendship Garden, Alum Rock Park, Almaden Quicksilver County Park, Heritage Rose Garden, and many others. The city is served by Norman Y. Mineta San Jose International Airport located 4 miles from the city center, San Francisco International Airport located 36 miles from the city, and Oakland International Airport located 36 miles from San Jose. 1. Hotel De Anza, 233 West Santa Clara Street, San Jose. 2. The Sainte Claire, 302 South Market Street, San Jose. 3. The Fairmont San Jose, 170 S Market St, San Jose. 4. Santana Row Shopping Center, 355 Santana Row, San Jose. 5. Holiday Inn Express Central City, 2660 Monterey Road, San Jose. 6. The Fairmont San Jose, 170 S Market St, San Jose. 7. Hotel De Anza, 233 West Santa Clara Street, San Jose. 8. The Sainte Claire, 302 South Market Street, San Jose. 9. Arena Hotel, 817 The Alameda, San Jose. 10. Hotel De Anza, 233 West Santa Clara Street, San Jose.